When last I left you, I was waiting for a new floor and furniture for our family room. The floor has been installed and the furniture delivered. 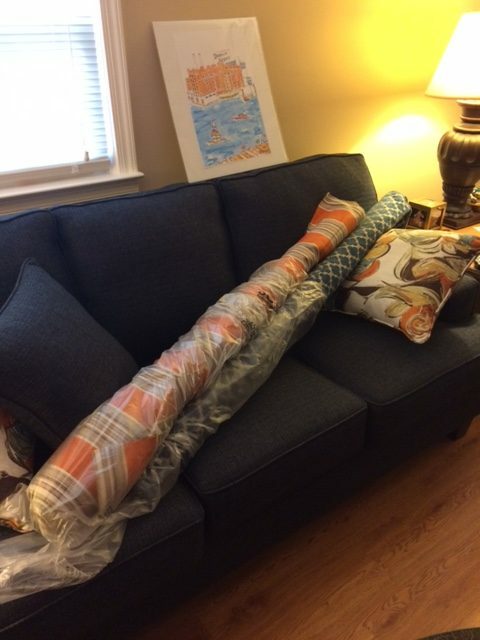 I did some Black Friday fabric shopping and scored two fabrics I intend to include in the room. I think I am truly in love with the new floor. We had a wall to wall berber prior to this, but I love the look of wood. The art work which I will frame for a spot in the room, is a painting by a local artist. 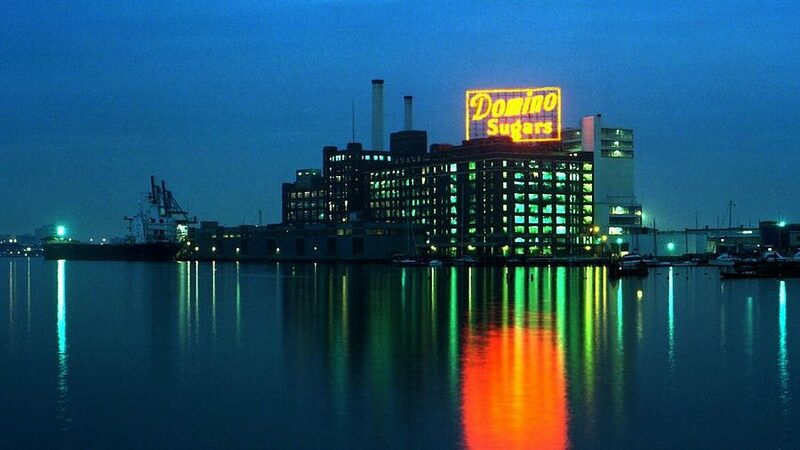 It features the Domino Sugar plant whose lighted sign greets incoming ships and visitors to the Inner Harbor of Baltimore. Hubster and I have a long running joke about this sign. When we were dating in college, we would go out downtown. Free parking was limited so often we would find a spot a long walk away from where we were going. One night a friend of Hubster joined us and stated he knew of a perfect free parking place…it indeed was a good, free parking spot illuminated by the Domino Sugar sign; however it was over a mile from our intended destination. Today, if we don’t find a parking spot within close proximity to where we are going we laugh and say, ” I guess were stuck under the Domino Sugar sign.” While not hysterical, it is a fond memory. I have to leave you here dear readers because at this point, I need to work on my own outdoor lighting for the holidays, not one hall has been decked, nor are the stockings hung by the chimney with care. Also, it seams seems the fabric will not sew itself. This entry was posted in At Home, Uncategorized and tagged Black Friday. Hooray! I’m delighted to read (and see) that the floor is installed and the furniture delivered. Love the photo you shared. And that painting? So great! My family has a similar story – when Expo was held in Vancouver in ’86 we always had to park by the house of the lady with the Canadian geese running about in her front yard. She was miles from Expo but very inexpensive. Today we’ll still say “well, we can always park at Canada Geese lady’s …” Best of luck with your Christmas decorating. We’re going to get our tree on the 5th. 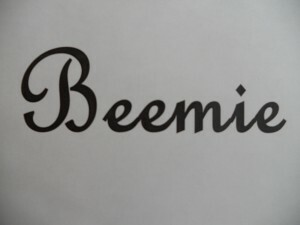 Beemie… Love the floor. What a “sweet” story about Domino. Have a great weekend! !